Programmer’s Notepad is a very useful tool for software writers who want a simple yet powerful text editor their Windows based computer. Programmer’s Notepad is a Better Notepad. Are you not satisfied with the regular Notepad that comes with Windows? I am sure you will wish for a better Notepad if you requires advanced features like Find, Replace, Regex, Syntax Highlighting etc. This year, one of the best software tool I found is Programmer’s Notepad. 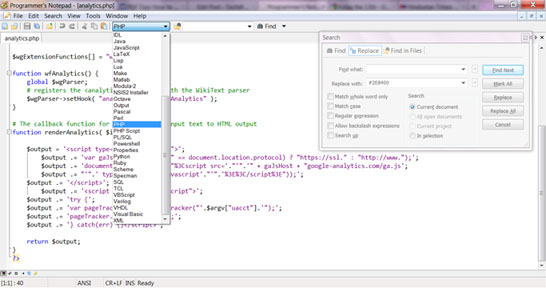 As the name suggests, it is an editor loaded with features that are useful for people who work with code for software or web pages. PN is a free and open source software. It is very fast, does syntax highlighting in all the popular programming languages, provides indentation, search and replace using regex AND it can set the encoding of the file / editor window to UTF-8 and UTF-16. PN can open multiple files in tabbed view, can show line numbers and can manipulate lines with shortcut keys (like vi editor) among other features. You might say that all these features are available in any good IDE –but as I said, I wanted to have a light-weight editor which can quickly load just like Window notepad. Well that was nice. I use notepad++ for programming. Looking forward to give a try to PN.